Have you purchased your Halloween candy yet? I am guessing there will be more trick or treaters than ever with Halloween on a Friday. So make sure you are stocked up on candy and save with this high value coupon. Don’t miss your last chance to get this special Halloween coupon for $2.00 off (1) 6pk. 8oz cans or (2) 2L of participating soda and (2) bags of Mars® candy. This is the perfect combo for any spooky halloween event. Click on the image and save! *If coupon does not work on Google Chrome, you will need to use a different browser to print it (e.x. Firefox, Safari, Internet Explorer). The Target School Supplies list has been updated with a bunch of items you can grab for FREE this week or for cheap including glue sticks and folders. I know these items are on your school supply list. Be sure to print this great Target coupon. Just search school once you are on the Target coupon page. Did you know that White Cloud Bath Tissue has a new and improved 2-ply Ultra Strong & Soft and 3-ply Ultra Soft & Thick Bath Tissue? I am kind of picky about toilet paper but have used White Cloud in the past and been happy with the softness. I look forward to trying their new improved bath tissue. I don’t like to pay more than I have to for anything including T.P. White Cloud is a premium brand of bath tissue available only at Walmart. You can use the Store Locator to find a store near you. 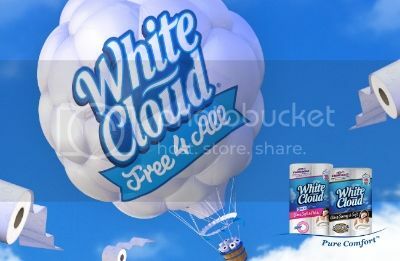 White Cloud is so sure that you will like it too that they want you and your family to enjoy it for free by joining the White Cloud “Free 4 All”. The White Cloud “Free 4 All” gives you a coupon good for a free 4-pack of White Cloud’s premium 3-ply Ultra Soft & Thick Bath Tissue. You can get the Coupon on Facebook. Fans of White Cloud on Facebook can print a coupon for a free 4-pack of White Cloud’s new and improved premium 3-ply Ultra Soft & Thick Bath Tissue with the purchase of any White Cloud Bath Tissue. The high value coupon ($1.97 off) makes them free. In order to receive this coupon, you will need to share the coupon on the social channel of your choice (Facebook, Twitter, or Pinterest). If you don’t want to share, you will still be able to print a $1 off coupon. White Cloud’s new 2-ply Ultra Strong & Soft and 3-ply Ultra Soft & Thick Bath Tissue comes in a 16 roll pack, yet costs the same as the regular price for 12-roll packs of Quilted Northern and Cottonelle. That means four more rolls of bath tissue for the same price other brands are charging for 12. By using the “Free 4 All” coupon, you can double your number of extra rolls. You will end up getting a total of 20 for the price of 12! Not too shabby! Plus now you are stocked up and don’t have to head to the store for awhile. White Cloud 3-ply has been named “best for less” by a national consumer magazine, and is known for their family of soft Facial Tissue, and strong Paper Towels. Discover the difference White Cloud’s new and improved premium 3-ply Bath Tissue and stronger and softer 2-ply offer. In order to learn more about White Cloud, be sure to Like White Cloud on Facebook, Follow White Cloud on Twitter, and Follow White Cloud on Pinterest. Disclaimer: Limit One (1) Coupon Per Purchase. White Cloud® Bath Tissue is only available at Walmart stores. No facsimiles or reproductions. May not be sold or transferred. Must present coupon at time of purchase. Any other use constitutes fraud. Valid only in USA. Void where prohibited, taxed or restricted. Case value 1/100¢. $1/2 Ziploc Bags Coupon + iBotta Offer = $.96 Each at Walmart! Head over here to print this coupon and check here for more coupon deals. Rare $1/1 Santa Cruz Organic Juice Coupon = $1.50 at Whole Foods! Also, check out this post with the most recent Whole Foods coupon match-ups to grab some more great deals while you are shopping. $1/2 Kettle Chips Coupon + Checkout 51 Rebate = Great Deals at Kroger and Walmart! Note: Also, check here for this week’s Kroger match-ups for other great deals. There is a new high value coupon available to print to save on Swiffer Starter Kits! This can be used on any starter kits including the dusters, wet jet, sweeper and more. A cookie that tastes like ice cream for FREE!? Yes, please! In order to get your free cookies all you have to do is log into (or sign up for ) your mPerks account and enter the code FREECOOKIE14 You’ll get a digital coupon added that you can clip to get a FREE package of Chips Ahoy Ice Cream Creations cookies from Mejier. You need to clip the coupon in addition to entering the code. You can then redeem your digital coupon by entering your mPerks account number and pin at the checkout. This coupon is good through 5/15/14. Also you no longer have to allow texting to sign up for m-perks.You can sign up by calling a number and just entering your pin. You most likely will get a $2.00 coupon when you first sign up as well. Be sure to check out the weekly sales and coupons matchups at Meijer this week. Looking to learn how to save money on groceries? Check out these 10 easy ways to save on groceries in under an hour a week. Plus join our Grocery Savings Challenge here. The same brands you love are now in bite-size pieces. You’re probably wondering why we didn’t think of this sooner! Enjoy new TWIX® Bites today. These little unwrapped morsels are perfect in any recipe or for snacking on-the-go. Save big on Bites at Walmart with this coupon. Be sure to print your coupons before they run out because who doesn’t want to save money on chocolate! You’ll be able to print two Save $3.00 on any two bags of TWIX®, 3 MUSKETEERS® and MILKY WAY® Simply Caramel Bites (6 oz. or larger) coupons when you click on the red “Refer Now” button. To get this coupon you will need to share this coupon with three friends via email or make one social post. You’ll also receive the coupon link via email in case you’re not able to print it when you unlock it. You will have one month to use your coupon before it expires. Want to #EatMoreBites but try the smaller packages? Print two Save $1.00 on any two bags of TWIX®, 3 MUSKETEERS® and MILKY WAY® Simply Caramel Bites (2.83 oz.) coupons. Not only are TWIX Bites great for snacking they are great for recipes too! $1/1 General Mills Cereal = $.99 Wheaties at Target and Rite Aid! Head over here to print this coupon and check here for more Target deals and check here for more Rite Aid scenarios. Huggies coupons are very rare so I wanted to share this great new $2 off Huggies Pull Ups coupon. If you share the coupon with your friends, it changes to a $3 off Huggies Pull Up coupon. If you have to buy diapers or pull-ups, you will want to be print these coupons today! If you use Pampers, there are a few printable Pampers coupons available too. Hello Kitty Hand Soap only $.94 at Target with Cartwheel Offer and Coupon! That is a nice price on this soap. You could include it in a gift bag with a nice loofah and a couple other Hello Kitty items for a nice gift! Head over here to print this coupon and check here for more Target deals. Want to save money at the grocery store? Be sure to sign up for this FREE grocery store savings app! This weekend there will be three coupon inserts in tomorrow’s paper: 2 Smart Source(SS), and 1RedPlum (RP). Wondering what coupons are coming in your paper this Sunday? You can click here to get a full Sunday Coupon preview. Check out what will be available and see whether you would like to buy more than one newspaper this week. Don’t get the paper yet? Sign up for this great discounted Detroit Free Press subscription. Don’t live in the Detroit area, get a discounted newspaper subscription for your area. You don’t have to be an extreme couponer to save money with coupons. Start slow and just cut out or print the coupons for items you would buy anyways. This is free money you are missing out on. Also don’t forget about printable coupons that you can print for FREE! Be sure to sign up for Ibotta to save even more on your groceries and household products. Plus you can also sign up for Checkout 51 for more coupons and savings! Or if you just want to add coupon directly to your store loyalty card, you can so that as well! Never clip a coupon again. With Cellfire you can save online grocery coupons directly to your supermarket savings card. No clipping, no printing, no forgetting! Save hundreds of dollars on your groceries with Cellfire’s free paperless coupons. Sign up for Cellfire Coupons today or add coupons to your card! Save on your groceries with SavingStar! SavingStar is a new eCoupon service that’s totally paperless – so there’s nothing to clip or print. Get over 30 eCoupons worth over $50! Don’t forget about the Bargain Shopper Mom Coupon Database where you can search for coupons too! Happy Saving! Head over here to print this coupon and check here for more Target deals. You may need to change your zip code to find this coupon. Click here and enter zip code 12345 then click the blue arrow. Don’t forget that Friday is the day to add free grocery items to your digital accounts. If you are near a Kroger (or Kroger family of stores), be sure to add the Kroger Friday Freebie to your Kroger card. This can only be added to your account on Friday but you do have some time to redeem this coupon. 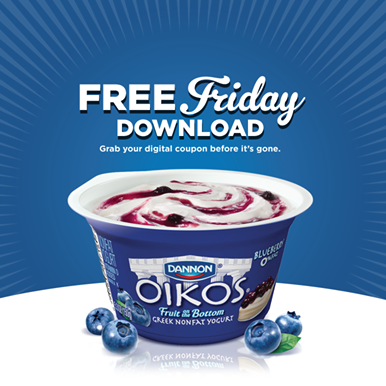 Today (Friday, April 18) ONLY download a digital coupon for one FREE Yoplait Greek Yogurt Cup. The coupon will be available TODAY ONLY, but you will have through 5/17/14 to redeem it as long as it’s loaded to your card. Today’s SavingStar Friday Freebie is 100% rebate on your purchase of 1 Single box of Kraft Macaroni & Cheese. This coupon can be activated in your account TODAY only and you must purchase the product by 5/4/14! This is NOT an Ecoupon that comes off at checkout. With Savings Star, you pay the full amount, but the amount will go into your SavingStar account within a few weeks. Once you have $5 in your account they will send you a check. Don’t forget that Friday is the day to add free grocery items to your digital accounts. If you are near a Kroger (or Kroger family of stores), be sure to add the Kroger Friday Freebie to your Kroger card. This can only be added to your account on Friday but you do have some time to redeem this coupon. Today (Friday, April 18) ONLY download a digital coupon for one FREE Chobani Yogurt Cup. The coupon will be available TODAY ONLY, but you will have through 5/3/14 to redeem it as long as it’s loaded to your card. Today’s SavingStar Friday Freebie is 100% rebate on your purchase of 1 Single Serve Dannon Oikos Greek Yogurt. This coupon can be activated in your account TODAY only and you must purchase the product by 4/20/14! This is NOT an Ecoupon that comes off at checkout. With Savings Star, you pay the full amount, but the amount will go into your SavingStar account within a few weeks. Once you have $5 in your account they will send you a check. Don’t forget that Friday is the day to add free grocery items to your digital accounts. If you are near a Kroger (or Kroger family of stores), be sure to add the Kroger Friday Freebie to your Kroger card. This can only be added to your account on Friday but you do have some time to redeem this coupon. 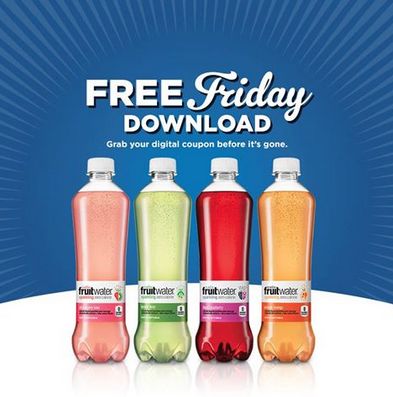 Today (Friday, April 11) ONLY download a digital coupon for one FREE Nestea (12 pk, 16.9 oz bottles) – Yes you see that correctly… that is a FREE 12 pack!!! The coupon will be available TODAY ONLY, but you will have through 4/26/14 to redeem it as long as it’s loaded to your card. Today’s SavingStar Friday Freebie is 100% rebate on your purchase of ONE (1) 3oz. StarKist® Tuna Salad Pouch This coupon can be activated in your account TODAY only and you must purchase the product by 4/17/14! This is NOT an Ecoupon that comes off at checkout. With Savings Star, you pay the full amount, but the amount will go into your SavingStar account within a few weeks. Once you have $5 in your account they will send you a check. Have you signed for Checkout 51 yet? This site gives you cash back on your grocery purchases. You can either use this on your computer or on your smartphone. Every Thursday morning, Checkout 51 updates with a new list of offers. All you have to do is pick the ones you like, purchase them at any store, and upload a photo of your receipt through our mobile app or website. When your account reaches $20, they send you a check! Here are the offers for the week. You can get money back on apples this week! Don’t say you can’t save money on fresh fruit. Any variety of fresh apples. Any Glade® Customizablesâ„¢ Starter Kit. 12 oz or larger, any variety. Sign up for Checkout 51 & Start Saving! If you like to get cash back on groceries be sure to sign up for Ibotta as well. Here are some Mars Bites printable candy coupons. These would be great for Easter baskets! The same brands you love are now in bite-size pieces…You’re probably wondering why we didn’t think of this sooner! Enjoy new 3 MUSKETEERS® and MILKY WAY® Simply Caramel Bites. These little unwrapped morsels are perfect in any recipe or for snacking on-the-go. Save big on Bites with this coupon at Walmart. Here are a few matchups to go with these coupons. It is rare to find a Starbucks Packaged Coffee products coupon. Plus these match up now with my favorite Target deal making the bags of coffee just $3.32!!! This is an amazing price for Starbucks coffee!! My husband will only drink Starbucks so I am always on the lookout for coupons to save me money. Making great coffee at home saves you from driving through and paying tons more. To get these coupons you need to change your zipcode on the coupon.com page. Change the zipcode to 17013 and then refresh the page to find your coupons. Click on beverage coupons to find quickly. There will be two coupons $2 Off 1 bag Starbucks Packaged Coffee coupon AND $4 off 2 bags Starbucks coupon. You can print each of these twice per computer. Final Price equals just $3.32 for each bag!!! Be sure to check out all the other Target Sales and coupons for the week. Today only, 2/7/14, you can grab a digital coupon for Kroger & Kroger family of stores for ONE (1) FREE Dannon Oikos 5.3 oz cup of Greek Yogurt. The coupon is good through 2/22/14, but it will only be available to download today. This coupon will have limited clips, so you may not want to wait. Be sure to check out all the other deals this week at Kroger here. Just log into your Kroger digital account to load the coupon (if you don’t have one, it’s easy and free to set up). Once it is loaded that is all you have to do. When you use your Kroger card at checkout, this discount will automatically be applied. Check out all the Kroger sales and coupons for this week including the MEGA sale that is still going on here and create a custom shopping list. There is a new Ibotta coupon for $0.50/1 gallon of White Milk . This is great because it works all stores that use Ibotta and is good on ANY brand! Who doesn’t want to save on milk!?! If you are not signed up yet for Ibotta it is FREE and so easy to use. Plus NEW users get an additional $2 back when they redeem their first offer within 10 days of joining! Sign up here and use your smartphone or tablet to access the app! Ibotta is great money saving app. Before shopping, check for offers on your favorite products. After shopping, take a picture of your receipt to earn cash. Every time you redeem an offer,they will send a new one. Tell them your likes and dislikes and they will send you personalized offers. Pamper yourself with the cash via Paypal or turn it in for gift cards including Starbucks! I love that this app doesn’t give you points or credits. It gives you real cash! 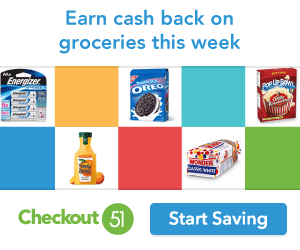 Get $0.50 off milk any brand! And if you like this offer, make sure to sign up for Checkout 51 which is very similar to Ibotta. They have a $2 sign up bonus as well AND a $0.50 off any orange juice offer! Checkout 51 does not require a smart device, you can use it on your computer! Sign up for Checkout 51 today. You can use both Ibotta, Chckout 51 and manufacturer coupons! Talk about double the savings. 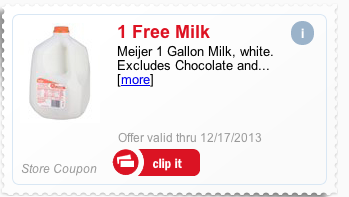 How would you like a FREE gallon of milk from Meijer? In order to get your free milk all you have to do is log into (or sign up for ) your mPerks account and enter the code HOLIDAYMILK. 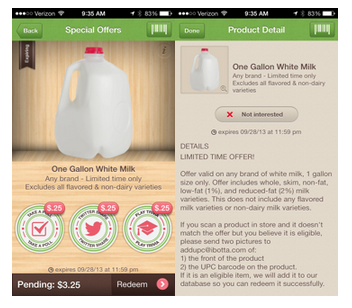 You’ll get a digital coupon added that you can clip to get a FREE gallon of milk from Mejier. You need to clip the coupon in addition to entering the code. You can then redeem your digital coupon by entering your mPerks account number and pin at the checkout. This coupon is good through 12/17/13! Also if you no longer have to allow texting to sign up for m-perks.You can sign up by calling a number and just entering your pin. You most likely will get a $2.00 coupon when you first sign up as well. 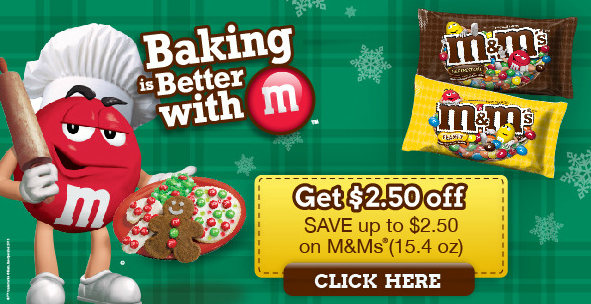 Here is a nice new super high value coupon to print — get up to $2.50 off 1 bag of M&Ms (15.4 oz)! We should see some great deals on these for holiday baking coming up soon and you can stack this coupon with the sales! The coupon can be used on Peanut M&M’s, Plain M&M’s, and Milk Chocolate M&M’s! Need some new holiday baking recipes? Be sure to check out all kinds of fun M & M Holiday Baking recipes here. Disclosure: I am a member of the Collective Bias® Social Fabric® Community. This shop has been compensated as part of a social shopper insights study for Collective Bias and Mars. 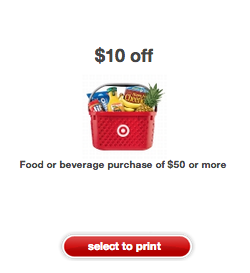 Here is a great new Printable $10 OFF $50 Food or Beverage Target Coupon. This is a great deal because since it is a Target Coupon, you can use additional manufacturer coupons along with it! Plus you can also stack Target cartwheel coupons too. Not sure how it all works? Read here all the tips and tricks on how to save at Target. Be sure to also view all the Target sales and coupons for this week here and create a custom shopping list. This features helps match up all the coupons and you can find the best deals easily! 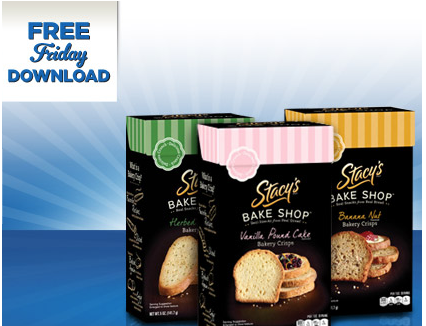 Today only, 11/15/13, you can grab a digital coupon for Kroger & Kroger family of stores for ONE (1) Stacy’s Bakeshop Bakery Crisps. The coupon is good through 11/30/13, but it will only be available to download today. This coupon will have limited clips, so you may not want to wait. It is a new month and that means new printable coupons or they have reset and you can print them again! Be sure to print any that you are interested in now before they run out of prints. This Lindt coupon which will get your FREE chocolate has reset so even if you printed it before you can print it again! Details here on how to use the Lindt coupon to get FREE or cheap chocolate! Here are just a few of the new coupons. Here is a great new $2/1 Lindt Product 3.5 oz or greater coupon that will make for FREE or cheap chocolate. Print your coupon quickly since with FREE chococale I am sure this coupon will not last long. Here are some deals to use with this coupon. Lindt Bars often go on sale for $2.00. I will check the price tonight when I visit the store. Regular price is just $2.59. Remember these deals don’t start until 11/3 and 11/10! Today only, 10/18/13, you can grab a digital coupon for Kroger & Kroger family of stores for ONE (1) FREE fruitwater. The coupon is good through 11/02/13, but it will only be available to download today. This coupon will have limited clips, so you may not want to wait.